Created on March 1, 1918, the 11th squadron is illustrated during the end of the First World War and during the beginning of the second. - In 1951, recreated on the base of Beauvechain as a night Fighter Squadron, it receives the badge of the Bat surrounded by an inverted yellow triangle. - From 1971, she migrated to the base of Brustem Saint-Trond, and begun as instructions squadron, first on T-33 and then on Alpha Jet from 1978. 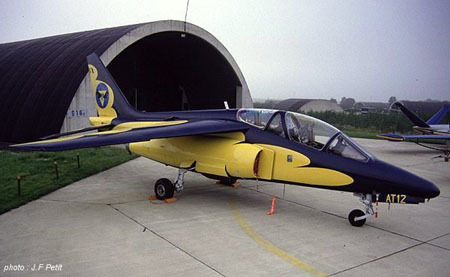 - In 1993, when it celebrates these 75 years, the Alpha Jet AT12 received a glowing scheme based on yellow and dark blue, applied as Bat shape. The 11th joined Beauvechain from 1996 to 2007, now deployed in France on the Base de Cazaux, it compose the squadron of the AJeTS program. For years this scheme was too complex to be realized in model, both in painting and decals, but now that the pre-cut mask appeared, it can finally see the light on our diplays.